In this episode, I’ll talk about taking care of feet in boots. You’ll also hear about one of my Tarot readings. I’ll talk about the uses for Primrose, and I’m going to give you a prompt, something you can do easily and in a short amount of time, to get some magic into your day. Do you recognize that sound? Pretty soon we’ll be walking around in boots over here. Autumn has arrived and winter is on tis way, and with it come the boots because of the temperature and the wet conditions. With the boots comes the risk of athlete’s foot and chafes, so I decided to gather some suggestions to avoid these, and cure them if you got them. If your feet are unhappy, the rest of your body suffers as well. If your feet often have to put up with a moist environment, like the typical rubber boot, you might find yourself experiencing the effects of foot fungus or athlete’s foot. Athlete’s foot, also called tinea pedis, is a fungal infection of the foot. It’s caused by a microscopic fungus that lives on dead tissue. There are at least four kinds of fungus that can cause athlete’s foot. These thrive in the warm, moist, cramped and dark environments of conventional footwear. It usually manifests in the moist areas between your toes, but sometimes also on other parts of the feet. Common signs and symptoms include itching, stinging and burning sensations in the affected areas, sloughing off of the skin, and even open soars. Untreated, athlete’s foot can potentially spread to other body parts or other people, including family members. If you don’t treat it, you also run the risk of bacterial infections. The foot has about 250 000 sweat glands, which can produce up to 250 ml of sweat a day. Use talcum powder or cornstarch to stay dry. If the weather allows, walk barefoot or in sandals or other shoes that aren’t so tight. Use socks and shoes that breathe. Wear flip flops or similar in public areas, if it’s warm enough. Wash your feet daily with soap and water and dry them well. Repeatedly soak your feet in a footbath with vinegar. Use one part apple cider vinegar to four parts water. The use of garlic as treatment for fungal infections is an old remedy, it can be used on any area affected by fungus. Thyme is another anti-fungal and contains antiseptic properties. Add 40 drops of Tea Tree oil to a small amount of water and soak your feet in it for 10 minutes. Dry you feet thoroughly with a towel, and maybe even a hair dryer, to make sure no moisture remains. Place a few drops of Tea Tree oil on the area. Chafing occurs when the friction and pressure on a single area of the skin become too great. Blood circulation is inhibited or destroyed. The epidermis separates from the dermis, forming a fluid-filled blister. If the blister continues to grow, pierce it and it can develop further into a wound. The pain of blisters is often caused by the skin being worn away and the wound being left unprotected. Moisture from sweat makes the risk of chafing greater and the pain worse. Make sure your shoes and socks are dry and fit properly. Use talcum powder or cornstarch to stay dry. New and unused footwear has all the qualifications to give you blisters. When buying new boots, it’s necessary to let the boots mold themselves to the foot before using them for longer walks. The first time you use your boots, dampen a pair of socks and wring them out. Walk one to two kilometers with the boots and set them to dry. Remember to walk on rough terrain as well, and not just on flat roads. The boots need to be molded for this type of environment as well. Be aware that the larger and stiffer the boots are, the more likely they are to give you problems. You also need to be aware that you may have bought a pair of boots that simply are not made for your feet. Then you should exchange them or sell them before they cause you too much pain. You could end up with worse than chafes. Bad shoes can cause back problems. If you don’t take good care of a chafe, you could get an infection. You can use the membrane on the inside of an egg as a form of artificial skin replacement, to make the chafe less painful. Apply a lot of Aloe Vera Gel and let it sit for 10 minutes. This should soothe the irritated skin. An infusion made on Marigold petals can be used to bathe the area. This will help it heal faster. Other herbs that can be used as washes are Thyme, Garlic, Lemon Balm, Lavender, Southernwood, Chamomile, Bay, Myrtle, Horseradish, or Sage. Apply tea tree oil or Honey to the affected area to promote healing by preventing infection, and forming a barrier against moisture. You can easily get overwhelmed with other people’s points of view and additional, detailed information about what options are available to you. At the end of the day, you’re going to have to make a decision, so sift through the advice and the information that’s available to select only the most relevant and helpful. Things turn for the better in terms of luck and money. 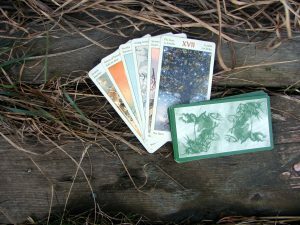 The cards indicate the beginning of new investments or the willingness to undertake a new business venture. There’s also the possibility of an influx of money from an unexpected source. You may see new opportunities come your way to generate a new source of income. You need to consider alternative ideas and viewpoints. You also need to weigh up the pros and cons of the options, and consider that there may indeed be another way around the problem. One of the cards suggests that you should throw something new into the mix. Consider something that is out-of-character or something you might not ordinarily do, or get around to doing. A methodical, planned and well thought-out approach will lead you to success. Be pragmatic and stay informed on practical matters. You need to get down to the basics and use your problem-solving ability to get to a solution. You also need to be able to leverage your various skills and resources in order to create success. A fatherly figure who likes to take care of others through providing advice, guidance, and wisdom, may help. He is a natural-born manager and business person. Today’s prompt is to review the year that has passed and look at what you want more of and what you want less of. I found a new scheduler, so you can book appointments again. I’ve removed some of the reading options. Both to make it easier for you to choose and to reduce my workload. Remember to book yourself a cup of tea if you need some help choosing or you have questions. That’s it for me for today. Thanks for listening to the Witch in the Valley Podcast. The next episode will, among other things, be about making and using a pendulum. If you have any questions, just reach out to me at linda@lindaursin.net Remember to rate and subscribe to the podcast on iTunes.